Proof approvals are very important for all designers and custom shops. Whether you design signs, t-shirts, trophies, book covers, business cards, vehicle wraps, or anything else, a smooth proof approval process is a necessity. Many designers use their email to send design proof to clients for approval. This can be a daunting task, especially when looking through the history of each email to see what edits were made. Track how long it takes to complete each design. This is very helpful especially if you are billing your client per time for your designs or if you are an employer and want to know how long it takes your designers to create a design. Collaborate with anyone you want, especially coworkers and clients easily. Obviously, you want this collaboration to be simple for your clients, but this feature is useful in case the sales person or manager needs to approve the proof before completion. Have a real time edits and comments tracked. Having each edit and all comments noted in your proof approval system is so vital especially if final design disputes come up from a client or another coworker. You should be able to pull up your design file and view each edit or comment about the design. Easily have access to each visual proof edit. Being able to see the visuals of each edit can be very beneficial especially if the client wants to see what the design was like in previous edit. Being able to easily pull it up and share can speedy up the design approval process. Proof approval is available online. Having access to online proof approval can be practical for several reasons. One, if your computers ever malfunction, your designs are safely stored in the cloud. Two, you can access your designs and status of approval from anywhere you have internet access. Have the ability to simply transfer approved designs to the next step in production. Once you have your proof approval, you will then need to complete this project for your client. Having an all-in-one system where you can automatically send the proof approval over to be managed for the next steps can save lots of time and hassle. Have the proof design management that is part of an all-in-one business management system. When you have your design proof approval management in an all-in-one management system that has the ability to manage each step of a job you will notice that all staff members can easily be in the know of each step. This makes for better organization and will save time, money and frustration. When looking for a design proof approval management system, the above features and benefits will certainly makes the design proofing process more smooth. 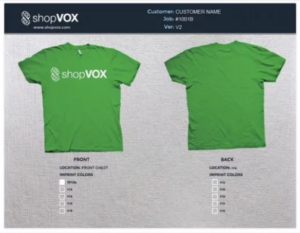 Fortunately, as a shopVOX user, you have access to all of these features. Hopefully, you are using the design proofing approval management feature in your software. If not, watch this design proof approval video to learn how to use it.